Mount Assiniboine in Mount Assiniboine Provincial Park is sometimes called the “Matterhorn of the Rockies” and is one of the most spectacular areas in the Canadian Rockies. We chose to make it our longest backpack trip of the summer of 2014. I had been there a few years ago but it was Raegan’s first time to this area. The last time I had come in, Kirk and I did the trail from Sunshine Meadows, which is considered the most scenic, but is also the most difficult. 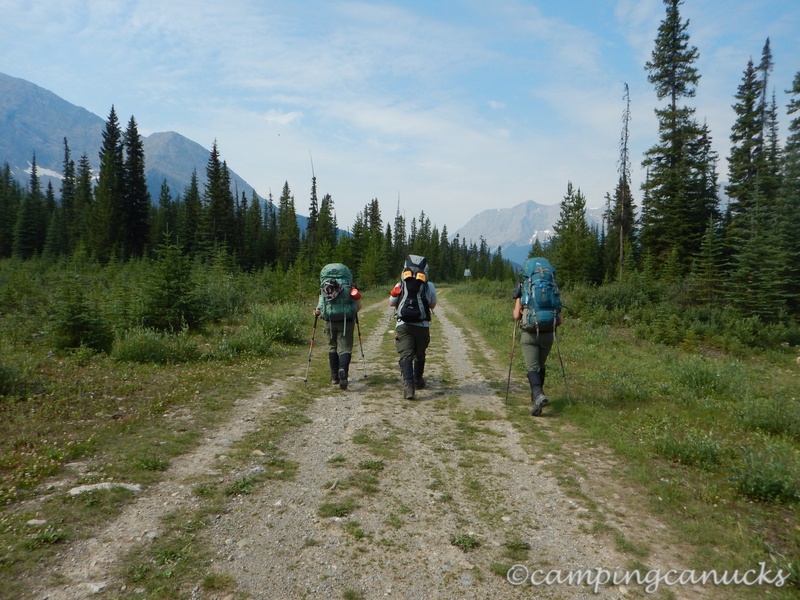 For this trip, we decided to pack in over two days along the Bryant Creek Trail from Mount Shark, as it is a 26km hike in to get from the trailhead to Magog Lake. That is a really long day with a 40lb plus pack. 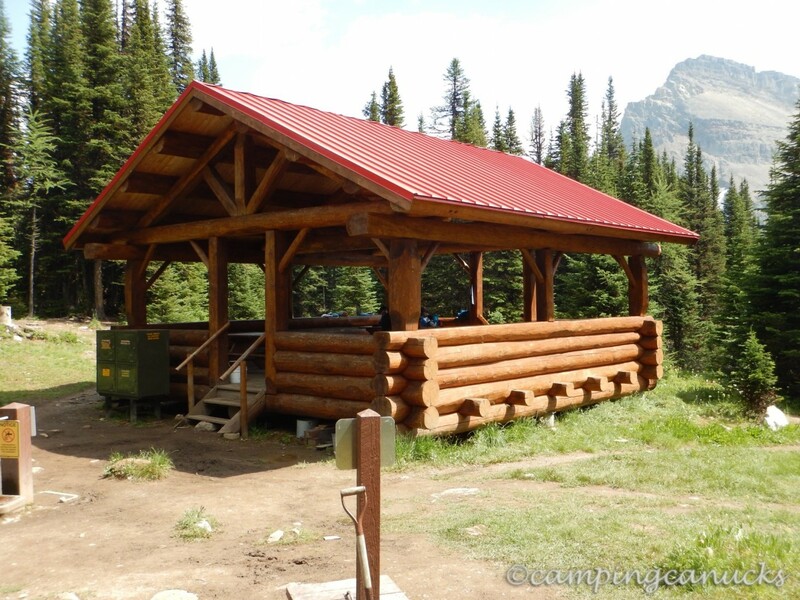 Our intention was to spend our first night at the Bryant Creek Shelter and then continue over Assiniboine Pass for three nights at the Magog Lake campsite. At the end of the trip, we planned to fly back on the helicopter from Assiniboine Lodge to Mount Shark. While the Bryant Creek Trail is the easiest way, it is certainly not the most scenic, with a large portion of the trail being down an old road through the forest. This is what we generally call a forest slog where you spend more time looking at your feet than anything else. The good thing, though, is that it is an easy trail without a lot of elevation gain for the first day. However, due to the forest fires burning throughout Western Canada, it was quite smoky when we started the trip and we could smell smoke in the air for the whole day. The hours passed slowly as we occasionally came along a bridge or a break in the forest that broke up the monotony. 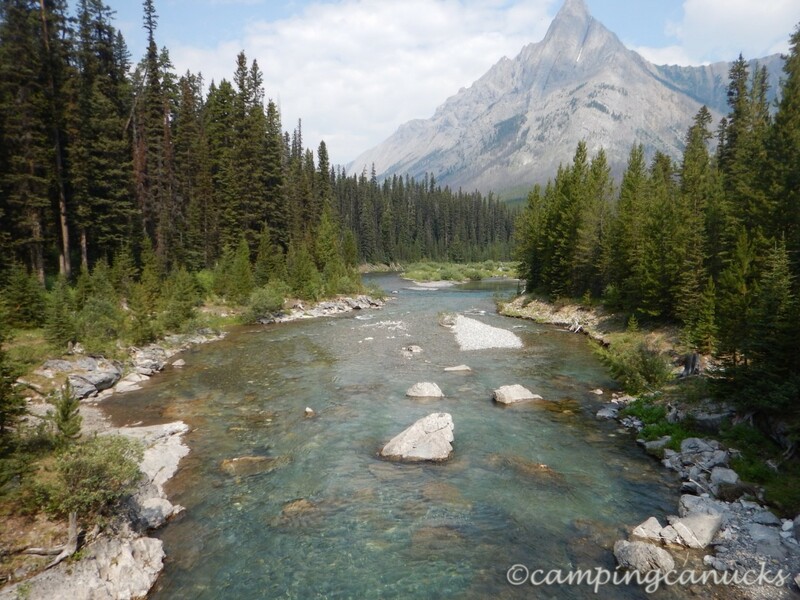 Occasionally we would come across a campsite that people can use as convenient overnight spots for both going in and coming out of Assiniboine. 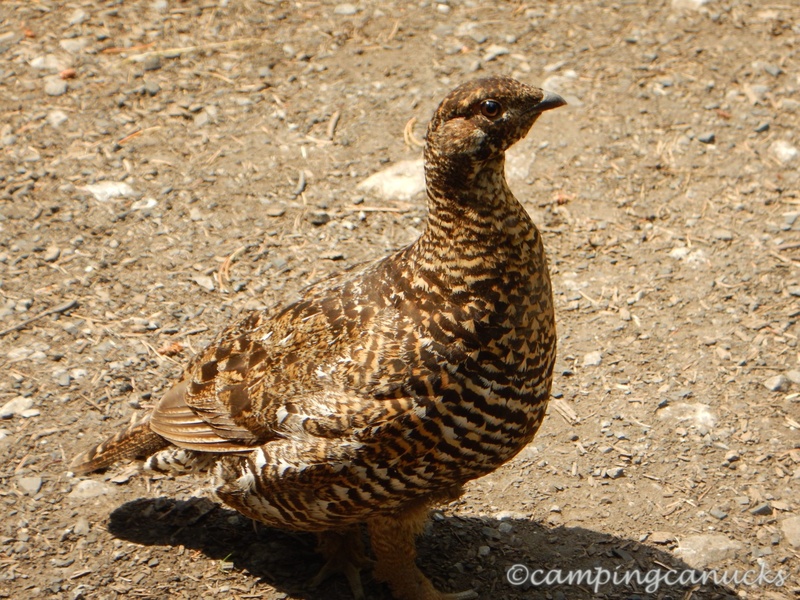 We also spotted quite a few grouse, all of which were females herding their chicks around. One of them actually walked up to us, crapped on the trail a few feet in front of us, and walked away as if it was challenging us to something! With only 13km to do that day, we were happy to only have about fours of hiking until we reached the shelter for the night. 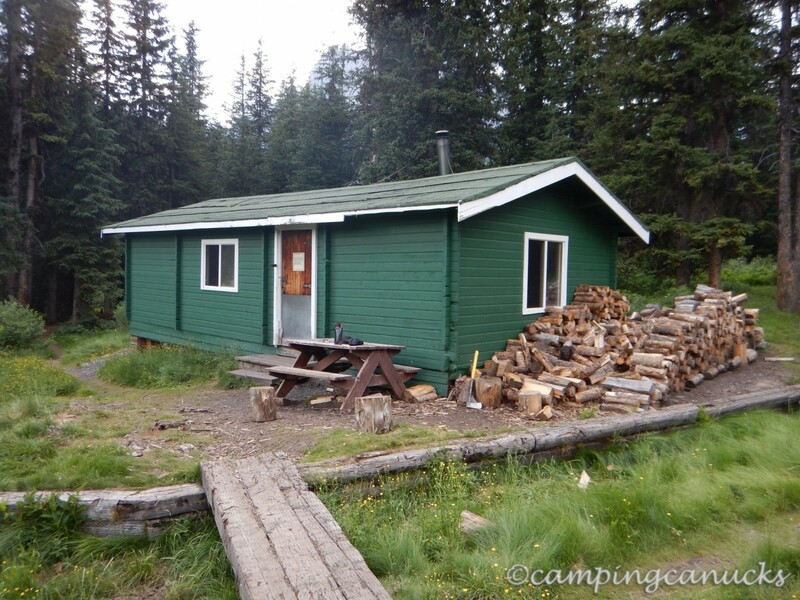 Being that the shelter is in Banff National Park, we had to have both a permit for the shelter and a backcountry permit to stay. It was worth it, though, as it did rain throughout the night and we didn’t have to worry about packing and carrying a wet tent the next day. Bryant Shelter has been there for a lot of years but is in pretty good shape. 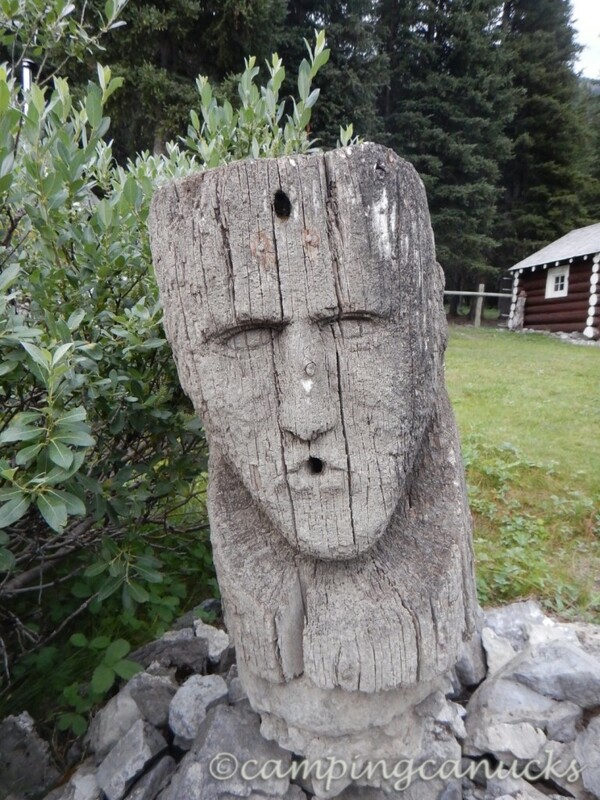 It sleeps 12 and sees a lot of activity in the winter by skiers heading into the mountains. With plenty of space to cook and a fireplace, it does make for a good layover point. We found, though, that it was too warm and too noisy to really get a good nights sleep, as we did share it with a couple of guys who were staying there while fishing in the nearby lakes. 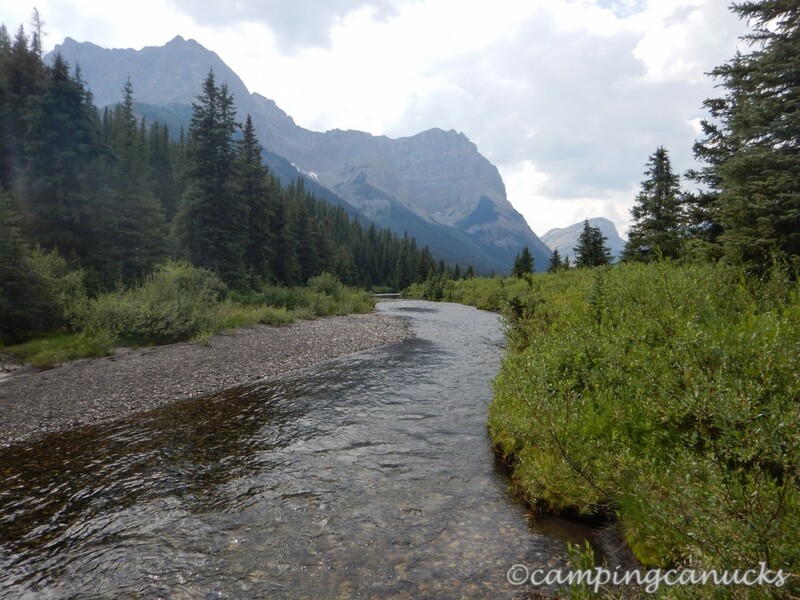 Bryant Creek flows nearby to provide a good source of water. 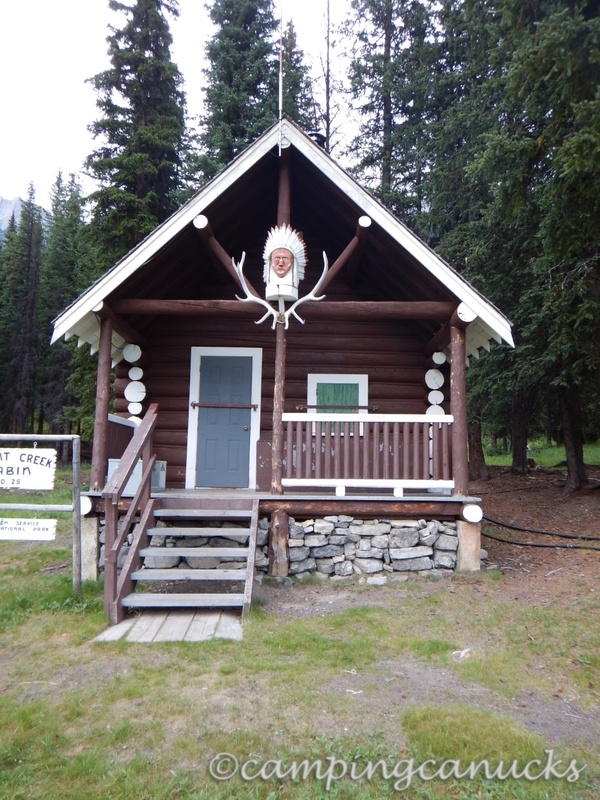 On the other hand, I think one of the nastiest outhouses we had ever used in the backcountry is the one at the shelter. It’s in great condition but it smells terrible. Thunderstorms and rain passed by throughout the night so we just spent most of our evening inside playing cards. After a somewhat sleepness night for us, we quickly ate and packed in the morning and continued on our way. 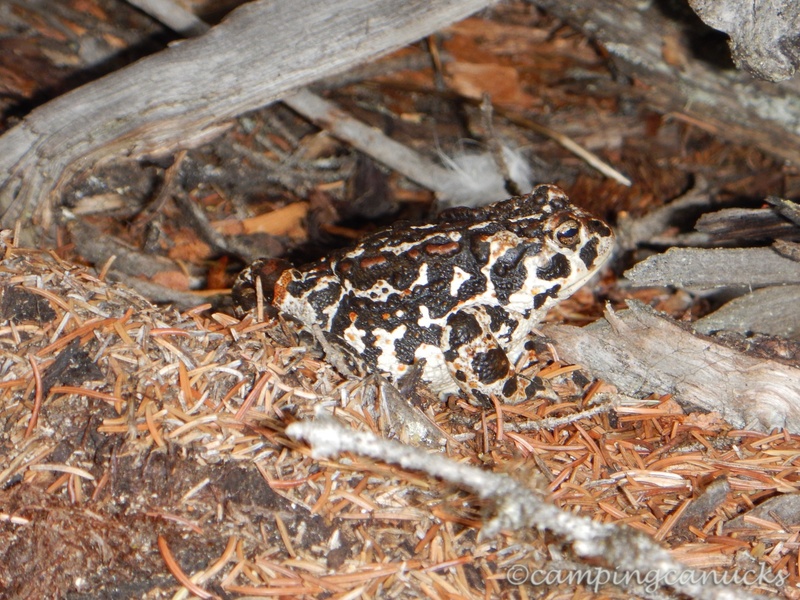 It wasn’t long before we came to the noted Bryant Creek ranger’s shelter. As there wasn’t a ranger staying there, it was locked up but we were able to walk around and check it out. 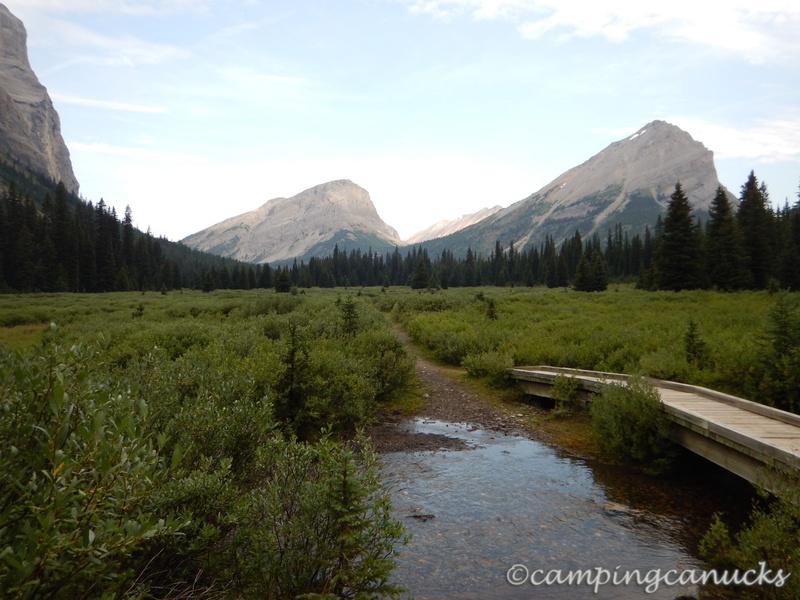 The first part of this day is along the valley bottom following Bryant Creek on the way to Assiniboine Pass. There are two trails, called the low trail and the high trail, that are usually available for use. The low trail is mostly used by horse groups, as it is easier and shorter, and the high trail by backpackers, which winds up above the treeline but is a bit longer. For the month of August, though, everyone is required to use the low trail unless they have a special permit due to the high grizzly bear risk near Allenby Pass that the high trail approaches. Allenby Pass is a known grizzly corridor and Parks Canada tries to minimize ‘bear and human interactions’ by restricting the trail. There were plenty of warning signs advising people not to proceed along the high trail. Once on the low trail heading up Assiniboine Pass, we were back in the trees for the next few kilometers without a lot to see. The trail winds through some really thick forests and there were some pretty steep switchbacks as we made our way over the pass. I was expecting more of a view at the top of the pass but there really wasn’t much to see. 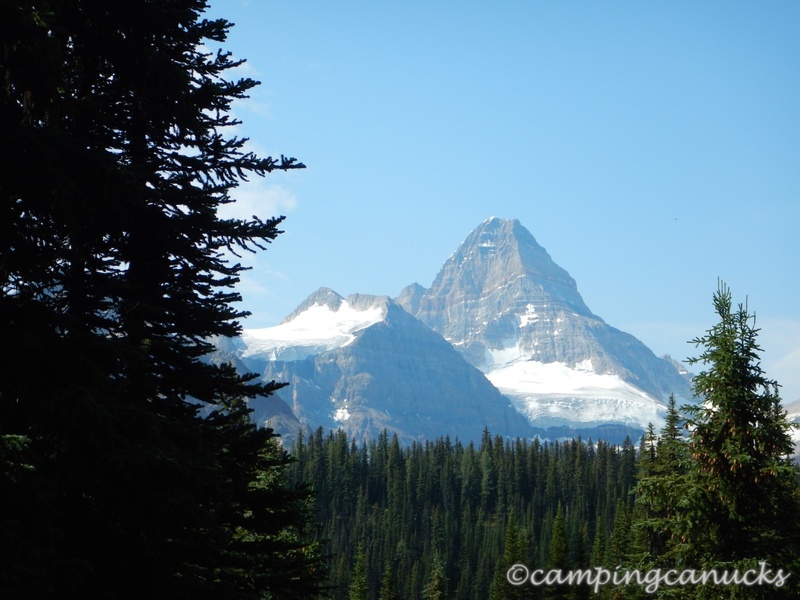 We had to proceed a bit further along before we caught our first view of Mount Assiniboine through the trees. From the top of Assiniboine Pass to the Magog Lake site was 4km, so we carried on. Being that is was the busiest weekend of the summer, we were bit concerned that the campsite would be busy and that we would have a hard time finding a tent pad. We did pass a number of people heading out so that raised our hopes of getting a site. Since Kirk and I had been here before, we knew which pads we wanted and as luck would have it, both of the pads were free. This was great because, in our opinion, the two pads were got are the best ones at Magog Lake (#21 and #22). The Magog Lake campsite is one of the best backcountry sites I know of even if it is one of the busiest. There is running water at the food shelter and plenty of bear caches and poles for safe storage of food. With the sheer number of people at the camp using the food shelter, though, we ended up setting up our tarp near our tents so that we had a dry place to play cards. A good thing since thunderstorms and plenty of rain rolled in for the next two days. In the days that followed, the camp became much quieter as most people continued on their way and it became more enjoyable to just sit in the shelter, playing cards or reading, or just to chat with our fellow backpackers. Now that we were set up for the next three days, we were ready to start doing some of the hikes in the area.